pinterest for RV trip planning??? – RV Cheaper! October 4, 2015 October 4, 2015 RV Cheaper! pinterest for RV trip planning??? Pinterest has turned out to be an awesome way to organize and map photos of places I’ve been to and places I’d like to see. 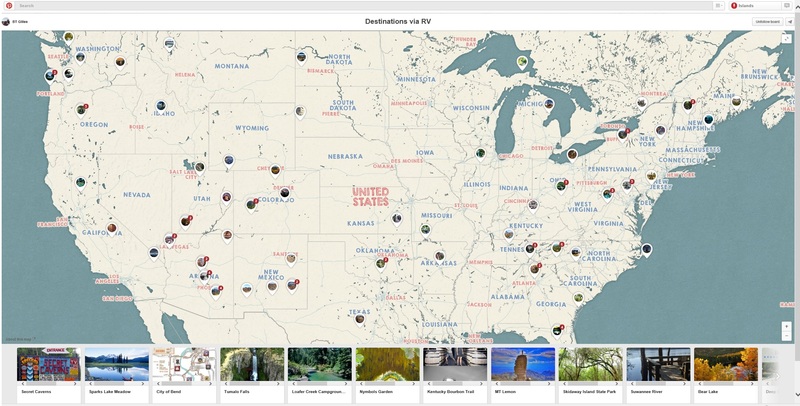 With the map on Pinterest I can zoom in on the areas we are travelling to and get some great ideas on the fly rather than trying to plan too far ahead. With 650 locations as of October 2015, I thought I’d share it with you just in case it helps you too. You zoom into an area and click on the little bubbles to see photos pop up along with a website link to a local RV park or attraction. The bubbles with numbers split into multiple bubbles as you zoom in. Once the number disappears it’s easier to find out about each attraction I’ve saved. Next basements, you can take it with you!